Trichomonosis, a disease caused by the protozoan parasite Trichomonas gallinae, first emerged in British finches in 2005 and has since brought about local declines in the breeding populations of Greenfinch and Chaffinch (Robinson et al 2010) in various parts of Britain. Migratory Chaffinches are likely to have taken the disease overseas. The initial focus of the 2006 disease outbreak was in the central and western counties of England and Wales. Examination of BTO ringing data, coupled with observations collected through the Garden Bird Health initiative's Systematic Surveillance Scheme, revealed that there was a pronounced shift in the geographical distribution of the disease towards eastern England in 2007. This was then followed by the appearance of the disease in southern Fennoscandian, (notably SE Norway, Sweden and Finland) where trichomonosis was confirmed at several different sites in 2008. A comparative molecular analysis could find no difference between the parasites present in finches at the British and Fennoscandian sites, suggesting that the Fennoscandian parasites had the same origins as those in Britain. An examination of BTO ring-recovery data suggests that migrating finches are the most likely mechanism by which the disease could have spread from Britain to Fennoscandia. 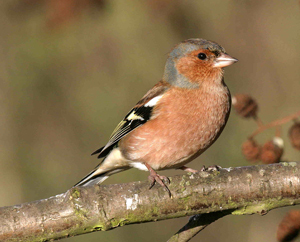 The pattern of movements between the different areas where disease has been reported, suggests that it is Chaffinch rather than Greenfinch that is the likely vector. 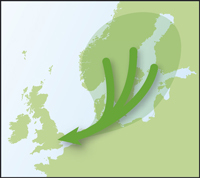 Our wintering Chaffinches are drawn from across Fennoscandia, while our Greenfinches tend to comes from the more western parts of Fennoscandia, such as Norway. While it is believed that Chaffinches migrate directly from Britain to Fennoscandia across the North Sea in the spring, the autumn migration route sees the birds move through Denmark, Germany, the Netherlands and Belgium before crossing the English Channel. Greenfinches make a direct crossing of the North Sea in both directions. Consistent with the hypothesis that the Chaffinch is the primary vector, we saw the emergence of finch trichomonosis in northern Germany in April 2009.